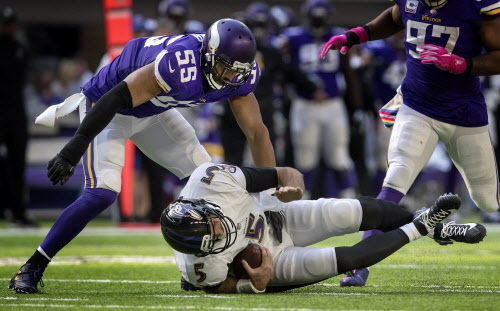 From the time they drafted him ninth overall in 2014, the Vikings’ investment in Anthony Barr has always felt a bit speculative. A team that planned to run a 4-3 defense used the ninth overall pick on linebacker many clubs had pegged as a 3-4 pass rusher — and while there was certainly a fit for Barr in Mike Zimmer’s defense, the decision to draft him seemed less about filling a commodity and more about what Barr could become. Barr’s draft slot came with a contract that could make him the highest-paid 4-3 outside linebacker in the league next season. His fifth-year option, which would pay him $12.3 million in 2018, is based on the transition tag amount (equal to the average salary of the 10 highest-paid players in the league at his position). That option amount has been driven up largely by 3-4 linebackers like Von Miller, Justin Houston and Chandler Jones, who get paid primarily to rush the quarterback. The Vikings’ decision to take Barr ninth overall was bound to be an expensive one, but they made it because they believed he could be a transformational player in their defense. They made it because of games like Sunday. The fourth-year linebacker set a career high with 11 tackles on Sunday, with two of them coming for losses. He had a sack, a quarterback hit and a pass breakup, as the Vikings blitzed Barr off the edge of their formation and deployed him to snuff out the short passes the Ravens were trying to throw with three of their top receivers injured. It’s not the first time Zimmer has praised Barr’s intensity this season, a year after the linebacker posted just two sacks and one forced fumble in a disappointing third season. Zimmer said last December that Barr “sometimes has a tendency to coast,” and Barr admitted in training camp that his effort could have been better last season. He’s remedied the problem this season, and while it certainly should be noted he’s in a contract year — the Vikings exercised Barr’s fifth-year option, but can cut him before the start of the 2018 league year without penalty — he’s making the kinds of big plays that had become something of a trademark before last season. Barr returned from a concussion on Sunday, after a week of absorbing scrutiny for the hit that led to Packers quarterback Aaron Rodgers’s fractured collarbone, but he said the criticism didn’t motivate him to prove a point a week after the Rodgers hit. He said he’s getting more freedom in the Vikings’ defense after four years with Zimmer, but added, “You kind of make your own freedom there sometimes. Whatever he’s doing, Barr is making the kind of singular impact the Vikings envisioned when they spent such a high pick on him in 2014. The more consistently he does it, the closer the Vikings’ vision is to becoming reality.